Another school year has passed. They go faster each year. Yet, each is unique because of the students who are with us. We do our best to help them develop their God-given potential. We strive to instill in them a love for life-long learning and care of their brothers and sisters in need. In short, we strive to develop one more class of Saint Marians. As they venture off into their careers, they join the network of alumni across the country and around the globe. 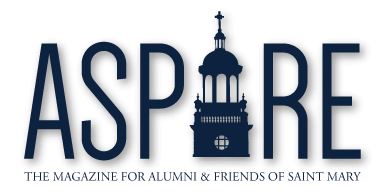 As a university grounded in the Vincentian and Charity tradition, we take service to our neighbor seriously. Whether packaging meals for those in Tanzania or donating school supplies to the youth in Burundi, with our students we learn firsthand how blessed we are to have the privilege of serving God’s people. Throughout the year, students participate in hundreds of service projects and come to the understanding that being of service is an essential part of being a Saint Marian. Doctor of Physical Therapy students and faculty volunteered weekly at Saint Vincent Clinic in Leavenworth—serving noninsured residents in poverty. Over Spring Break, Campus Ministry took a group of students to St. Louis to help those in need. And our Spires football team dedicated over 3,000 hours to our local community! These experiences broaden and deepen our students’ understanding of our diverse world. As we continue to grow into a Catholic liberal arts university of tomorrow, not only are we focused on serving one another, we are reminded of our rich history of academic excellence and our dedication to the development of the whole person—intellectually, socially, and spiritually. This equation looks different today than it did just a few years back, calling Saint Mary to respond quickly— preparing our graduates with not only the academic content they need to succeed, but also the soft skills demanded in today’s world. Communication, organization, strategic thinking—skills that are so difficult to teach, yet so critical to employability. Finally, we said farewell to those who served Saint Mary so long and so well— Dr. Ron Logan, Kathy Ducey, Dr. Bryan Le Beau, Dr. David Greene, Sister Susan Rieke, Sister Roberta O’Leary, and Karolyn Dreiling. 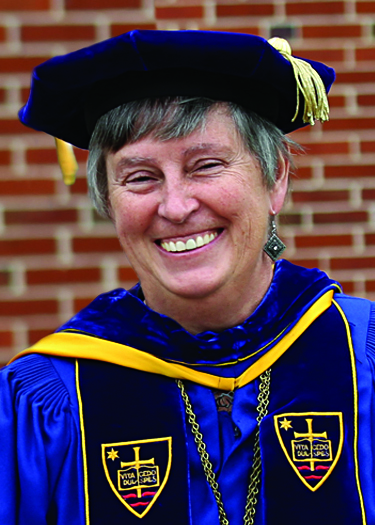 Sr. Susie, professor of English, retired after over 35 years of service. David, professor of psychology, is moving to Colorado to be close to family now that he is a grandfather. He served at Saint Mary for 23 years. And Karolyn, vice president for development, leaves USM on a cloud of success. We’ll miss her leadership and her gentle presence. I also lost my right hand and my dear friend, Dr. Bryan LeBeau, provost and academic vice president, who is retiring. This summer, we will be welcoming our new provost, Dr. Michelle Metzinger, from Presentation College in South Dakota.